This is evident from the opening of the album, as he launches into the lines of "Legend". 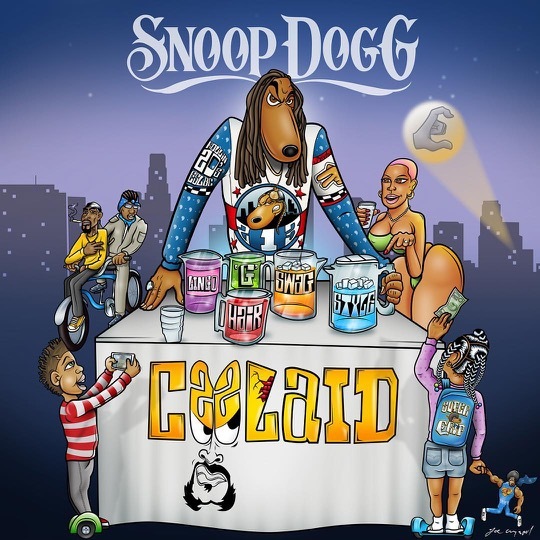 A darker, harsher beat pulses in the background of the track, as Snoop brags about beating a murder charge, "1996, I beat a 187 (Murder was the case)". It's standard hip-hop braggadocio but it sets a more sinister tone that runs throughout the first half of the album. He mixes classic beats with new school production to shock the senses, and he switches back and forth to keep you on your toes. "Ten toes down" feels like it came straight out of the 1990's, and it carries straight into "Don't Stop". This album peaks on the fourth track with "Super Crip". Simultaneously grimy and catchy, it is a song that strikes a great balance between styles to worm its way into the back of your mind. Of the 20 tracks on this album, this is one of the few that will see regular play in my rotation after I've put this album down. Which I can't say about much of the music that I listen to for review. By the time I'm ready to write, I'm usually done. But this one will keep coming back for more. The first half of this almost 80 minute long album is rather satisfying, but is starts to fail under its own weight with a bloated and somewhat generic latter half. "Feel about Snoop", "Light it Up", "Kush Ups", "Double Tap", and "Let the Beat Drop" feel like blatant attempts to garner radio success, with "Double Tap" feeling particularly egregious. A song about direct messaging girls after liking a picture of them on Instagram. It feels honestly cringey and brings back unfortunate memories of Yo Gotti's "Down in the DM". Which was terrible. Let's be honest.